We think teamwork doesn't always have to be built in the office, so we're offering creative team-building experiences for your work team. Step out of the cubicle and into CityArts. Our trained instructors will provide a unique and engaging art experience while your team is encouraged to think "out-of-the-cubicle" and build strong relationships. Each experience includes demonstrations, individual and/or group exercises. Use the creative process to drive innovation and to think in new, creative ways. Recognize and remove barriers to creative thinking. Reframe problems to generate new and unexpected solutions. Embrace collaborative problem-solving and discover individual strengths to complete group tasks in the office. 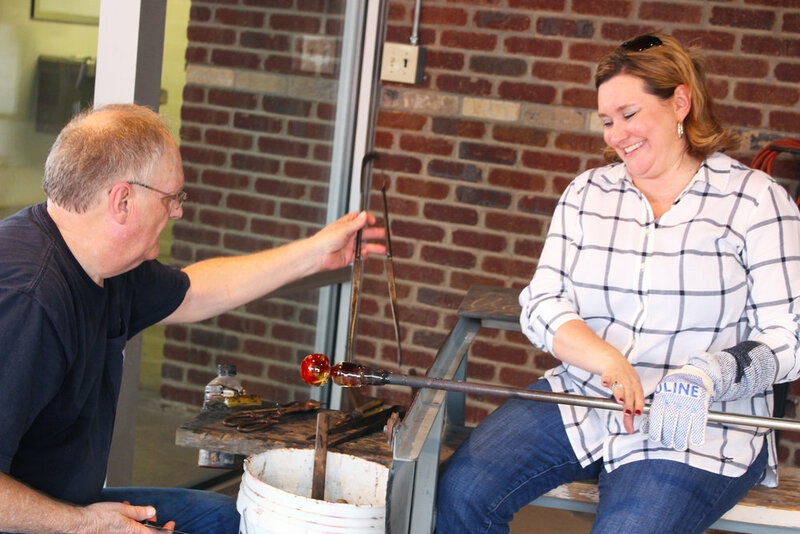 For groups of 8 or less, the glassblowing experience focuses on individual participation with team encouragement. Participants can create paperweights, a glass flower or a seasonal item. The fee per person includes materials and instructor for two hours. For groups of 14 or less, the ceramics experience focuses on either individual participation with team encouragement or group participation. Projects can include simple bowls or dishes on the wheel or by hand building, or a group project using hand building techniques. The fee per person includes materials and instructor fee for three hours. For groups of 20 or less, the painting experience focuses on either individual participation with team encouragement or group participation. Projects can include a single painting your group recreates, individual paintings or a group mural project. The fee per person includes materials and instructor for three hours. For groups of 20 or less, the mixed media experience focuses on either individual participation with team encouragement or group participation. Projects can include mixed media paintings or glass mosaic pieces. The fee per person includes materials and instructor fees for three hours. CityArts requests that all team-building experiences be scheduled at least one month in advance. Call Alisha at (316) 350-3242, email her at agridley@wichita.gov, or fill out the inquiry form below. Staff members at CityArts will put together your team-building experience. You'll be sent a confirmation email with your total payment (can be made in advance via check, Visa or Mastercard, or on the day of the experience), a description of your experience, special instructions and a parking map. Show up the day of your event and have fun! Will you be needing a meeting space to "talk shop" before, during or after your team-building experience? CityArts has a couple meeting spaces that can fit your needs so you can spend your day at CityArts. For a small additional cost, you can have access to the meeting room for the whole day, break for lunch and break for your team-building experience.